Many men spend huge chunks of money for buying suits but not all end up with an expected outcome. Many find flaw in there expensive suits either with the fabric type, fit or designer patterns. As suits turned to be one of the great wardrobes in men's world of fashion one cannot deny of owing at least a pair of suits for him. You are much respected and seen dignified by the kind of apparel what you wear as it gives a first impression about you. Be it formal business meeting or a casual fete, you are expected to show your presence only with these suits. If you are frustrated in finding the right quality suits that worth the money you spend then you need to stick to branded collection such as Calvin Klein. The brand offers uncompromised durable suits that hold supremacy in its style and features. The shoulder slopes gives perfect fit by resting on the shoulder blades that cause even a bony men to look bold and valiant. The shoulders are generally broader giving a men bit wider look on his upper portion which enhances the handsome quotient. No extra fabric is left at the chest and armhole portions. The trousers fit fairly well on the waist offering great comfort while one moves. 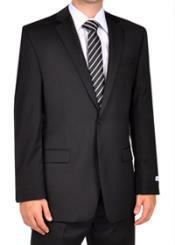 The fabric which is been used in Calvin Klein suits are high quality wool. No compromise in the fabric quality is one of the specialties of the suits. The fabric is actually a light weight material that gives wearer a relaxed and comfort feel. The high quality wool that are been sheared from the high breed sheep varieties are used which include - super 120's, 150's, 180's, cashmere and merino wool. The fine fabric selection is one of the luxuries elements of this suit. 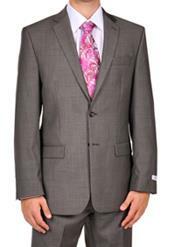 Tailoring: The branded suit possesses smooth seems with unnoticeable joints of parts. The front body is fully canvassed which is achieved by the careful cut and make offering a custom piece of canvas between the front plate, lapel facing and lining that settles down perfect on the shape of the wearer's body. Experienced pattern cutter and expert tailor are generally been employed for this make. Trims: A good tailor knows the importance of trims as even a minute details cause a big difference on the appearance of the wearer. The quality inputs are generally been used where genuine horn or mother of pearl buttons that are been sewn at the fastening edges of buttons. Durable bemberg linings, YKK zippers, surgeon's cuffs are the other quality inputs been used on the suits. These incredible features have made the Calvin Klein suits to be of a great craze among men.